Though many of them are presumed dead, exactly what happened to these high-profile personalities still remains unknown. January 17, 2017, 11:22 a.m. The Lost Roanoke Colony. The Dyatlov Pass Incident. The death of Natalie Wood. The Black Dahlia. The Bermuda Triangle. Bigfoot. Did Tony Soprano die at the end of "The Sopranos"? We love a good unsolved mystery, and unexplained disappearances that have managed to baffle historians have also intrigued the general public. Unlike the FBI's decades-old search for the remains of a certain convict/labor organizer from Detroit, we've successfully managed to track down 14 missing people of note, including six particularly intriguing head-scratchers followed by a few more names that you may recognize. In a majority of these cases, the unaccounted-for person was legally declared dead at some point, although their body has never been recovered and their whereabouts are still unknown. Some of these vanishings have been subject to massive search parties, wild speculation, media sensationalism, false accusations, dead ends, wrong turns and the occasional TV miniseries. Some are rather tragic. And in one famous instance, the identity of the AWOL individual was unknown even before he vanished into thin air (by jumping from a plane no less). So cue up the appropriate music and join us as we delve into the realm of the mostly unknown. Although the saga of a brazen air pirate known to the media as D.B. Cooper (he purchased his ticket under the alias of "Dan Cooper") may not be familiar to most young'ns, the aviation industry, the residents of Ariel, Washington and — last but not least — the FBI, will never forget Thanksgiving Eve 1971 when a nattily attired gentleman skyjacked Northwest Orient Airlines Flight 305 bound for Seattle-Tacoma International Airport. Shortly after the 30-minute flight departed from Portland, Oregon, Cooper disclosed to a flight attendant that he was in possession of explosives and demanded $200,000, four parachutes and a refueling truck upon landing at Sea-Tac. Once the plane landed at Sea-Tac after circling for two hours while authorities made preparations, the ransom payout and parachutes were handed over and Cooper released Flight 305's passengers. The refueling process began, at which point Cooper revealed to the plane's pilot and a handful of other crew members his desired destination: Mexico City. About 30 minutes after the flight departed at 7:40 p.m., Cooper, wearing a parachute and in possession of the ransom money, leapt from the plane's aft airstair at 10,000 feet and into the night over southwestern Washington, near Mount St. Helens. To this day, the identity of D.B. Cooper remains a mystery, and it's unclear if he even survived the jump. Still, in an ongoing effort to retire the nation's only unsolved skyjacking, the FBI has processed thousands of possible suspects, including copycat hijacker Richard McCoy Jr., Seattle-based flight attendant Kenneth Christiansen and a deceased engineering surveyor from Oregon named Lynn Doyle Cooper. Recently, a group of citizen investigators analyzed the $3 clip-on necktie from JC Penney that Cooper left behind on airplane seat 18E. They claim to have found thousands of microscopic particles, including cerium, strontium sulfide and pure titanium, which indicate he was likely an employee of an aerospace engineering firm. “These are what they call rare earth elements. They’re used in very narrow fields, for very specific things,” Tom Kaye, lead researcher for the group Citizen Sleuths, told a Washington news station. "Of all the possible things for him to leave on the plane, the tie was incredibly fortunate for this investigation" because neckties are washed so infrequently, the group wrote on their website. Numerous books, films, songs and TV show plotlines have been inspired by the legend of D.B. Cooper. Heck, he's been name-checked on everything from "30 Rock" to "Breaking Bad." And as you may have guessed, David Lynch named cherry pie-loving, black coffee-swilling FBI agent Dale Bartholomew Cooper from "Twin Peaks" after him. In August 2013, the Washington State History Museum in Tacoma opened an exhibit dedicated to the 1971 skyjacking. It's unclear if the man of the hour attended. In July 2016, the History Channel aired a two-part special about the case, with retired investigators poring over evidence and pointing the finger at Robert Rackstraw, a 72-year-old man who lives on a boat in the San Diego Bay. Rackstraw has said he's considering filing a civil suit against History Channel over the accusation. In that same month, the FBI declared it would no longer actively investigate the Cooper case and would direct resources to other investigations. Pioneering aviatrix, author, teacher, magazine editor, celebrity fashion designer, cigarette spokesperson. In her short 39 years on this planet, Amelia Earhart managed to amass an impressive CV, but it was her mysterious disappearance while attempting a round-the-world flight that continues to intrigue to this day. Although there are numerous theories, no one can be certain what really happened when Earhart and navigator Fred Noonan vanished over the Pacific Ocean on July 2, 1937, while en route to Howland Island in a Lockheed Electra 10E, a disappearance that resulted in the most intensive — and expensive — search effort in American history up to that time. It's commonly believed that the Electra ran out of fuel and Earhart, who was declared dead in absentia in 1939, ditched the plane into the Pacific near Howland Island – the "crash and sink theory" — although there's been no shortage of wild myths and legends surrounding Earhart's disappearance. In 2012, researchers embarked on a $2.2 million expedition to prove that Earhart crashed her plane on the tiny island of Nikumaoro. Our favorite Earhart disappearance legend, other than the one where she's employed to spy on the Japanese by F.D.R., has to be the one involving the iconic pilot pulling an Abbie Hoffman — a ludicrous scenario in which Earhart secretly completed the round-the-world flight but, tired of all the fame and fortune, decided to move to Monroe Township, New Jersey, and change her name to Irene Craigmile Bolam. Author Joe Klaas ran with this theory in his 1970 book, "Amelia Earhart Lives," and, as a result, the real Irene Craigmile Bolam was none too pleased. Bolam, a banker and amateur pilot, filed a $1.5 lawsuit and publisher McGraw-Hill quickly pulled Klaas' book after it was published. It's not every day that a prime minister vanishes into the sea. However, just that happened on Dec. 17, 1967, when the 17th prime minister of Australia, Harold Holt, decided to go for a swim at Cheviot Beach near Portsea, Victoria. Following two days of exhaustive search efforts, the authorities declared that 59-year-old Holt, a skilled swimmer and longtime member of Parliament who had served as prime minister for less than two years, was presumed dead. His body was never recovered and it wasn't until 2005 that a coroner ruled the cause of death to be accidental drowning — he was either swept out to sea or eaten by shark — in a risky location known for strong rip currents. At the time of his disappearance, Holt was taking pain meds for a shoulder injury. Not long after Holt went missing, the rumor mill started working overtime and speculation as to what exactly happened that fateful morning at Cheviot Beach continues to this day. Among the more wild myths, many fueled by the fact that Holt's disappearance was not followed by a formal inquiry and that his body was not found: he was abducted by a UFO; he faked his own death so that he could decamp with his mistress, Marjorie Gillespie; and, most famously, he deliberately swam out to sea where he was plucked from the water by a waiting Chinese submarine and whisked off to China. This ridiculous theory, in which Holt was revealed to be a communist and longtime secret agent for the People's Republic of China, surfaced in British journalist Anthony Grey's controversial 1983 book, "The Prime Minister Was a Spy." To this, Holt's wife Zara responded: "Harry? Chinese submarine? He didn't even like Chinese cooking." Suicide is another theory tied to Holt's disappearance and was suggested in the 2007 documentary "Who Killed Harold Holt?" Several sources close to the late prime minister have adamantly denied that he suffered from bouts of depression or a mental illness. Whatever the case, Holt will forever be remembered by a wickedly ironic recreation complex in the suburbs of Melbourne, the Harold Holt Swim Centre, and by the slang expression "do a Harry Holt." Translation: to bolt — to disappear abruptly. By now, it's been well established that Teamsters kingpin Jimmy Hoffa was offed by the mob after vanishing from the parking lot of a restaurant in suburban Detroit on July 30, 1975. But for decades, even after the super-corrupt union leader was declared dead in absentia a full eight years later, the question remains: what in the hell did they do with his body? Hoffa's disappearance has yielded a delightfully sordid assortment of lore, lies and potential leads. Some have been pursed by the FBI, some have not, while most pertain to the whereabouts of his remains. Just a taste: entombed under Section 107 at the now-demolished Giants Stadium in New Jersey; hidden in the concrete foundation of Detroit's Renaissance Center; stashed under a horse barn; interred beneath the driveway of a suburban home; tossed into a swamp in Florida; buried under a backyard swimming pool in Bloomfield Hills. Other scenarios have seen Hoffa's body sent through a meat grinder, weighted down in a river, disintegrated at a fat-rendering plant, crushed in a car compactor, buried in a gravel pit, and, last but not least, stuffed into an oil drum and deposited at a toxic waste dump in New Jersey. The latest entrant in the always-riveting game of Where in the World Is Jimmy Hoffa's Body? According to one source, he's interred in a shallow grave on a vacant lot in Oakland County, Michigan, about 20 miles north of the restaurant where he was last seen alive. Apparently, this location was intended as a temporary dumping ground before Hoffa's body was transferred to a more relocation. That plan, however, fell through. This revelation comes from Tony Zerilli, a reputed Detroit mob boss who was incarcerated at the time of Hoffa's disappearance. Zerilli told New York's NBC 4 News during a January 2013 interview: "I'm as certain as I could possibly be. If I had money, I'd like to bet a big sum of money that he's buried (there)." He adds: "I'd like to just prove to everybody that I'm not crazy." And on the topic of money and crazy, Zerilli is promoting his new, self-published book titled "Hoffa Found." As of publication, Hoffa's remains remain at large. In his book, "Fatal Journey: The Final Expedition of Henry Hudson," esteemed history professor Peter Mancall highlights evidence that suggests Hudson could have been violently murdered by his crew and not forced into a small boat with a few others and left to die. The possibility that Hudson managed to survive the mutiny, changed his hair color and relocated to Rio de Janeiro where he lived out the rest of his life as a popular yet enigmatic lounge singer named "Bob Simpson" has been ruled out. 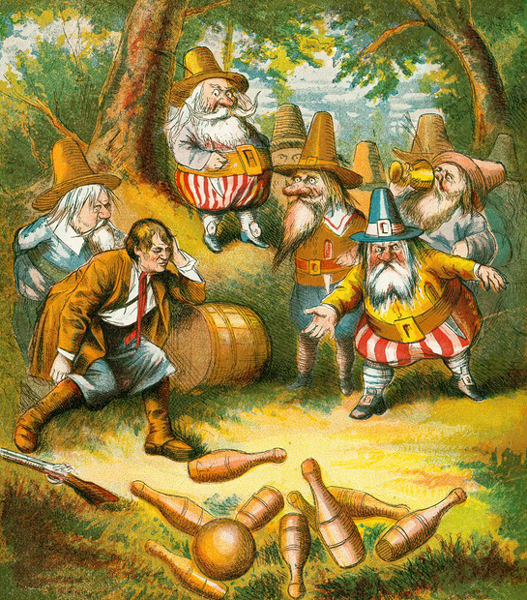 And as for Hudson's doomed crew, you never know, they could have very well reemerged nearly 200 years later alongside a few other former disgruntled Hudson sailors — the crew of the Half Moon — as hirsute bowling enthusiasts living in New York's Catskill Mountains. "Let's throw another a shrimp on the barbie." "That's not a knife. This is a knife." This is just a small sampling of (mostly unfortunate) phrases associated with the great country of Australia that have been embedded into the pop culture lexicon. And as for that last one, it really did happen — and Paul Hogan had nothing to do with it. The 1980 disappearance of Azaria Chamberlain remains one of the most infamous, if not the most infamous, murder cases in Aussie history. And it wasn't until 2012 — 32 years, a super-sensational trial, several dramatic coronial inquests, demoralizing public scrutiny and a "Seinfeld" punchline later — that Azaria's beleaguered parents found closure when a coroner ruled that their 9-week-old daughter had indeed been snatched from an outback campsite near Uluru by a marauding wild dog. Following Azaria's disappearance, her mother, Lindy Chamberlain, was tried and convicted for the murder of her infant daughter and sentenced to life in prison. She served three years before being released after a piece of Azaria's clothing was found, totally by chance, in a dingo's lair near the campsite. Two years later, the convictions against Lindy and her husband Michael were overturned and all charges were dropped. However, it wasn't until a fourth inquest in 2012 that an amended death certificate — a death certificate that legally backed the Chamberlains' initial claim that their daughter was taken from her tent by a dingo during the night and carried off into the wilderness and killed — for Azaria was finally issued. And as for that famous phrase, it's actually a misquote from the 1988 Meryl Streep film, "A Cry in the Dark" in which Streep, playing Lindy Chamberlain, cries: "The dingo took my baby!" Dorothy Arnold: Manhattan socialite and heiress. Disappeared December 1910 in New York City at the age of 25. Jean Spangler: Actress and dancer. Disappeared October 1949, in Los Angeles at the age of 26. Frank Morris (pictured): Criminal. Disappeared June 1962, from Alcatraz Federal Penitentiary along with John and Clarence Anglin at the age of 36. Jim Thompson: American businessman. Disappeared March 1967 from the Cameron Highlands, Malaysia, at the age of 61. Sean Flynn: Freelance photojournalist and son of actor Errol Flynn. Disappeared April 1970 in Cambodia at the age of 28. Oscar Zeta Acosta: Attorney, activist and traveling companion of Hunter S. Thompson. Disappeared 1974 in Mexico at the age of 39. Richey Edwards: Guitarist, Manic Street Preachers. Disappeared February 1995 in London at the age of 27. Bison Dele: Retired professional basketball player for the Detroit Pistons. Disappeared July 2002 in Tahiti at the age of 32. Editor's note: This story was updated with new information since its original publication date in February 2013. Though many are presumed dead, exactly what happened to the likes of Amelia Earhart, Jimmy Hoffa and D.B, Cooper still remains unknown.